Description: The Masthead Mat is an usual technique that can be used to create rugs, coasters, and similar round items. Pendants and earrings can be made as well, if you use fine material (2mm or less). 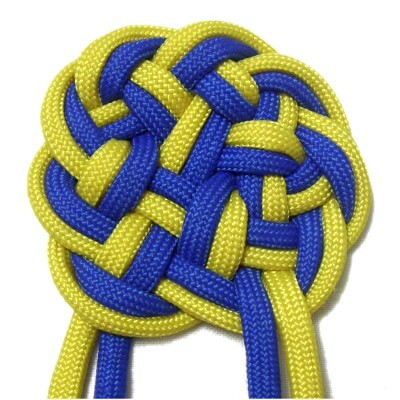 This design has features similar to the Maedate Knot and the Pitcher Knot. 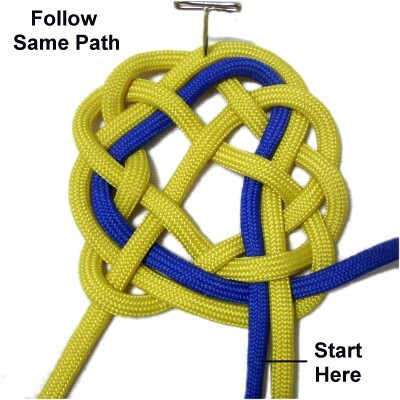 Since this is a mat, the knot is supposed to be filled in with more than one cord. You can use only one, but it's hard to get the inside tight enough to eliminate all the space. Step 1: To practice, you need 2 cords, at least 45 inches long. I recommend you use Parachute Cord when practicing, or other material that's at least 4mm wide. When using Paracord, heat the tips to melt the outer sleeve, to prevent the inner core from sliding out. Step 1: Secure one end of a cord to your board, on your right. 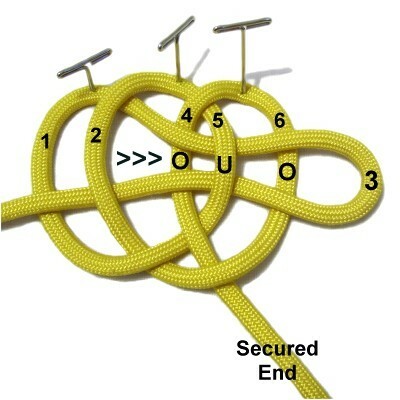 Make three clockwise loops, starting 12 inches from the secured end. 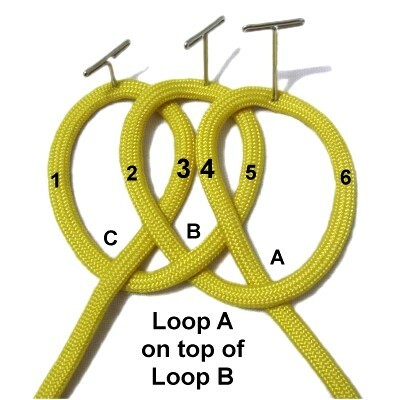 Move from right to left, and mentally label them A - C. The loops should be at least 1-inch in size. 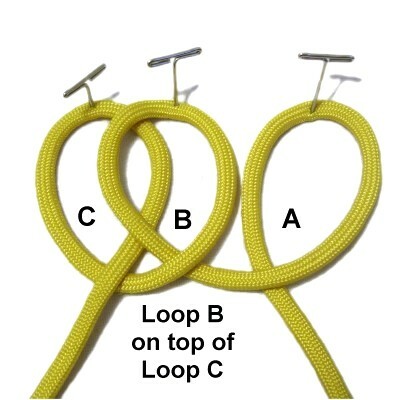 Step 2: Move Loop B to the left, placing it partially on top of Loop C.
Step 3: Move Loop A to the left, placing it partially on top of Loop B.
Mentally number each half of the loop in the order they are resting now, starting on the left. Segments 3 and 4 lead to the ends, and will be moved in the next steps. Step 4: Make a bight with segment 3, pulling on the end of the cord as needed. Weave it over - under - over segments 4 - 6, heading right. Secure it on the right. 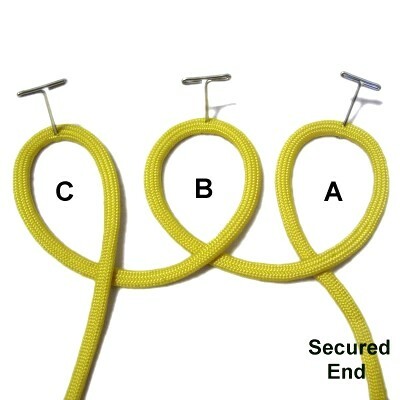 Step 5: Make a bight with segment 4, pulling on the secured end as needed. Weave it over - under segments 2 and 1, heading left. 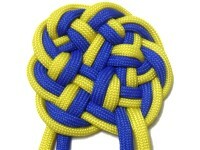 Step 6: Weave the secured end through the knot from right to left, alternating over - under the segments. You start out by passing over segment 3 on the right. Step 7: The Masthead Mat should now be turned, so both ends are at the bottom. The secured end will be on the left. 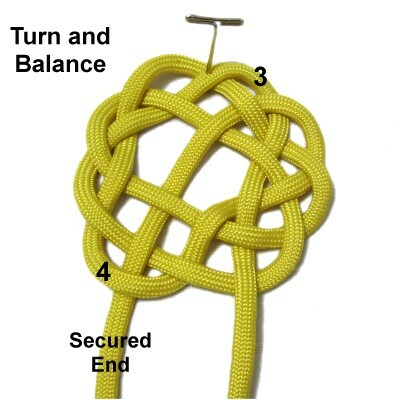 Balance the knot, but don't tighten it yet. You need room to add the second cord. 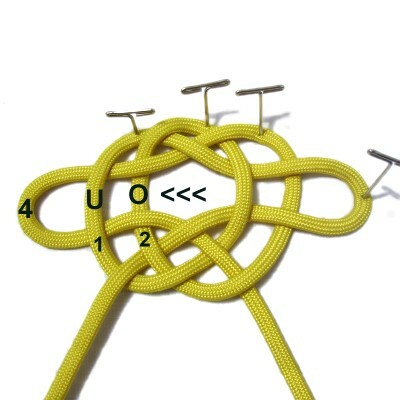 Step 8: Use the second cord to follow the same path as the first one, all the way through the knot. The best place to start is at the end of the cord resting on the right. Step 9: The Masthead Mat should be completely tightened and balanced, so there are no gaps. 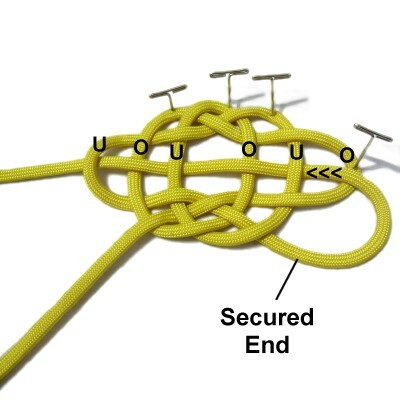 You can finish off the ends by securing them to the back of the knot. Have any comments about the Masthead Mat? Contact Me.